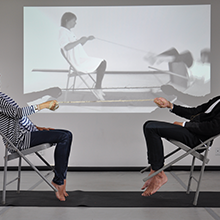 After two years of long-distance, telepathic performance—with Robyn Cook in Africa and Lauren von Gogh in Europe—the artists used a Watermill Center spring residency for Sit, Sit, Sit, Sit, in which they shared the same physical space for the first time. They inhabited New York City and the East End of Long Island, in addition to the Watermill Center facility and grounds, to undertake a series of experiments and performances relating to their attempts at creating a telepathic connection. While in New York, they will attempt to test whether their telepathic connection has synchronized their thoughts. They will use the project’s various media in new ways once being in the same place has changed the basis of their collaboration. Ultimately, what they create will form a Sober&Lonely book.